The car maker Toyota and the French company EDF will soon propose a network of plug-in points and sockets to fill up hybrid cars with electricity. French electricity is mostly carbon dioxide free (78 percent of nuclear and 10 percent hydro), so electric cars would prove to be a good thing to mitigate climate change. This plan will concern all Europe and will begin this fall with cars of EDF’s fleet that will test drive these hybrid cars under every-day conditions. The partnership will start with four Plug-in Hybrid Vehicles (PHV) but both companies are confident in the success of the operation and the fact that it will lead to more vehicles and hopefully the commercialisation of such models. Toyota’s PHV technology combines a gasoline engine with an electric motor which can be charged in two ways: either whilst the vehicle is driving and by recovering energy otherwise lost during braking, or by connecting the vehicle to an electric supply source at home, work or at a public charging station. For short journeys, a PHV would rely more on electric power, offering significant reductions in CO2 emissions through reduced consumption of fossil fuels. For longer distances, it would switch to a combined electric/gasoline mode. 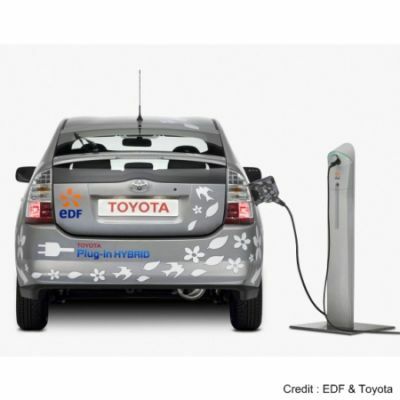 EDF and Toyota have also developed an innovative charging and invoicing system, equipped in each of the test vehicles. This system is compatible with a new generation of public charging stations, which aim to make electric power more accessible on public roads and car parks and to reduce the cost to the customer. For more than 40 years, EDF has acted to promote the use of electricity for transport and rechargeable vehicles, in-line with its strategy of sustainable development. “I am delighted by this partnership between EDF and Toyota on a new generation of vehicles. This innovation is a promising move towards acceptance of electricity as a competitive and ecologically-viable source of energy for European motorists. It strives to reconcile the challenges of individual mobility, economic growth and environmental impacts”. Notre planète.info : EDF et Toyota s’allient en Europe pour développer les véhicules hybrides rechargeables.